Do you think this Christ fellow everyone seems to adore so much thought that you should march off in battle and slay the heathenish? I'd tend to think he was more inclined toward sitting down over a bottle of wine and breaking bread and discussing things other than the most advantageous way of staving off mutual annihilation. How about we have just one Church. We can make it a big round 500 story building in each City. Inside the front door you will find doors leading to the elevators that will take you to your proper place of worship. The Amish will be allowed space on the first dew floors to avoid being forced to utilize new fangled inventions. The Islamic sects will be allowed to have an open minaret at the top to chat prayers from, or a smaller one down around ground level off toward Mecca. The extreme sects will be afforded space high enough that their mass suicides will be assured success and over a catch basin to make cleanup easier. All true faithful Jews, Christians and Islamic recognize that there is only one God, they even agree that he was the God of Abraham, so they should have no problem accepting that theirs is the true temple of God, and it is a huge Mansion with many rooms. The Hindu may need to have the back side of the building to allow the free entry of cattle, monkeys and other reincarnated or acesended souls. And they should be kept away from the ritual animal sacrifice religions, I'm fairly certain that the Amish would be right at home with the Hindu but some of them might take to worshiping the Amish livestock. We can even build a stadium into the structure and let the Christians and whoever they are pissed at this week battle it out and keep the carnage contained. And just imagine the ticket sales to a great 10 hour all out death match between two factions be it the FBI and Extreme Right Wing Fundamentalists or a slower, more refined Catholic and Protestant hit and run action. The Knights of Malta Hospitaliers and Sisters of Mercy can be kept busy patching up the survivors. In addition to sports/combat stadiums the Temple can accommodate shopping, banking, civil departments, restaurants and apartments so that those that wish might never need to leave the building and be exposed to the Heathen World outside the Holy Temple Grounds. Then we can stop being concerned with World Wars being fought over Religion, Political Leaders creating public policy based on the belief that they are divinely manifested to guide the World to his one true faith. 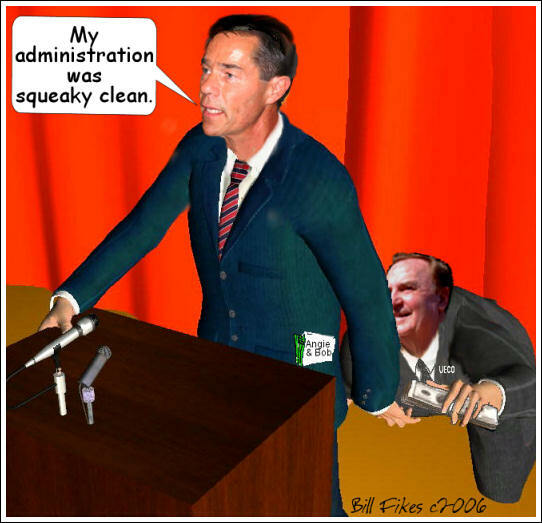 Tony Knowles recently proclaimed himself squeaky clean of VECO influence. I doubt that Tony really forgot but maybe a few Daily News clips can refresh his memory. When Tony was elected he appointed VECO owner Bill Allen to head up his transition team. Bill Allen helped raise over four hundred thousand dollars ($400,000.00) for Tony to use as he saw fit and Tony gave VECO’s clients a lease on a multi billion dollar oilfield without the requirement of competitive bid. The Governors Fund didn't account for what had already been contributed to Tony’s campaign. It was in addition to his campaign contributions. Immediately following the events described above, Tony Knowles arranged to give British Petroleum a completely rewritten lease. The Lease was conveyed in a manner intended to avoid the competitive bid process and given free of charge to BP even though Governor Knowles’ own advisers told him that the lease could possibly sell for as much as $225 million if put out to competitive bid on the same revised terms Tony was giving BP for free. As soon as the deal was done the following companies put additional $59,000 into the “Governor’s Fund.” October 7, 1996, BP $20,000.00 and ARCO $10,000.00. On October 17, 1996. BP, an additional $10,000.00. October 30, 1996, ARCO, an additional $4,000.00. On November 5, 1996, VECO gave $15,000.00. In an Anchorage Daily News article published May 30, 1998: Fritz Pettyjohn, a former Republican legislator from Anchorage, was quoted as he emerged from a closed-door meeting of the Republican Party Central Committee. The Committee had elected to show a united front, rejecting a proposed withdrawal of Party support, from John Lindauer. John Lindauer was the Republican Party’s Nominee for Governor, and he had repeatedly been caught lying about his candidacy. Placing his loyalty to party and unity over his loyalty to ethics and honor, Fritz Pettyjohn, described John Lindauer as a “pathological liar” to an Anchorage Daily News reporter. After doing so, he then said “But, hey, he's our guy” and went on to explain that in the spirit of party unity, they had decided to hang tough with Lindauer. Parties and party leaders will face credibility problems until they choose to place loyalty to honor and ethics above their loyalty to party unity and a united front. I invite the Democratic Party to take a hard look at the above and do with Tony Knowles what the Republicans should have done with John Lindauer in 1998.